Are you using TUJ Notifications? You should be! Here’s how! I stopped the movie, logged into Remote AH, and picked up the enchant. It’s typically been selling between the 12k and 17k range on my server. (One was listed in the Alliance AH for 25k at the time I bought this one). I thought about flipping it, since Reverberating Shadowspirit Diamonds are running ~220g on my server, but I think I’d rather make my money back by selling the cut gems over time. No rush. I still have my notifications set, so if another recipe drops, I’ll flip that one. The first notifications I set up was with my Google account, but since I don’t keep my phone set to vibrate when I get an email (I get several hundred a day), I kept seeing the messages long after they were sent. I missed several fantastic deals, so I had to find a better solution. I set up a Twitter account specifically for use with TUJ. Twitter accounts are free, and it was quick and easy to set it up. 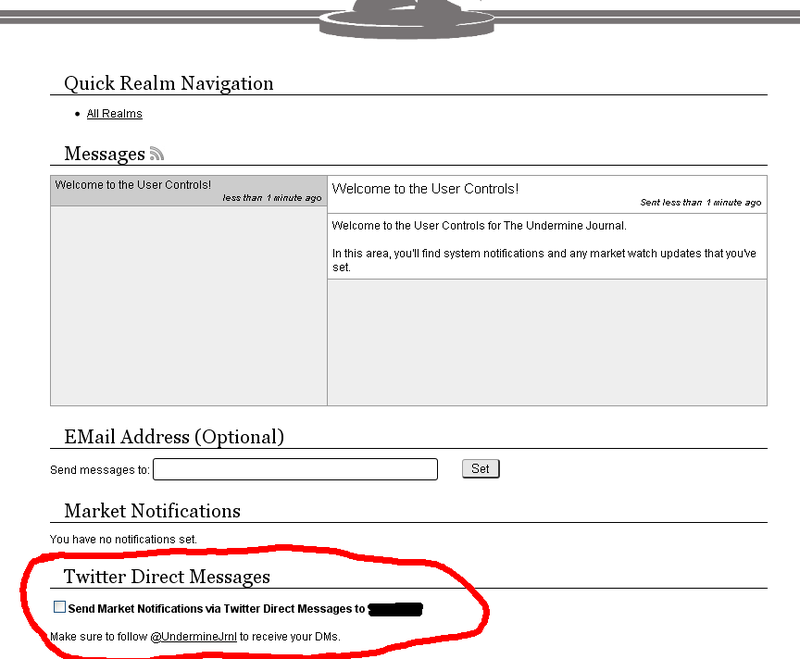 In order to receive Twitter notifications, you have to follow “UndermineJrnl” on Twitter! I did a quick search for that account, and clicked “follow”. Easy as pie! I set the Twitter app I use on my phone (the one created by Twitter) to send me notifications when I receive a direct message. [click on ACCOUNTS, SETTINGS, NOTIFICATIONS and turn MESSAGES on]. This means that Direct messages sent to this account via Twitter will come through as text messages to my phone. When you go to The Undermine Journal you will see three lists of all US servers: Alliance, Neutral, and Horde. 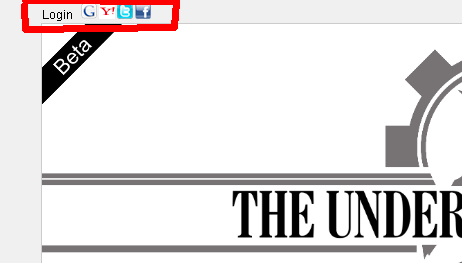 In the top right corner is a link to login. You can either click on the icons for Google, Yahoo, Twitter, Facebook, or you can click the word “login”. 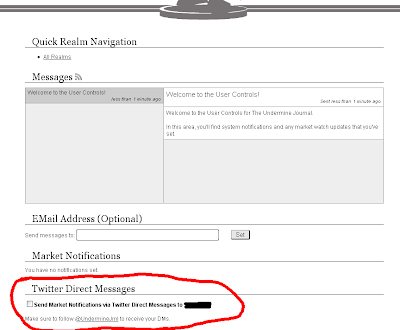 Check the little box under Send Market notifications via Twitter. There you go… the hard part is done!! Now you need to pick your server and set up some notifications. 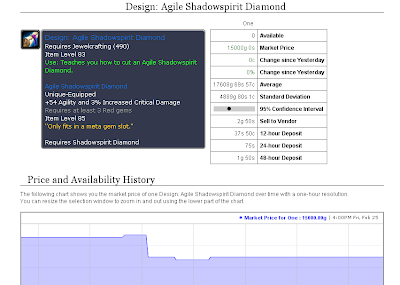 Here’s and example using Design: Agile Shadowspirit Diamond. In the search box that pops up for your server’s page, type in “Design: Agile” and hit enter. (You don’t have to type full item names in. Partial matches will bring up a list of possible items.) In this case, there is only one item that fits with our search, so the page pops up for the design. Since these usually run between 8k and 20k on my server, I’m putting in what I am willing to pay. I set it to notify me when the “cheapest cost to buy” 1 item is under 3000 gold. Then I click on the CREATE button. The notification will show up as set with a button next to it which allows me to remove it. Now I just set notifications for every item I’m interested in, sit back, and wait for the text messages! It’s important to note that TUJ doesn’t monitor Auction Houses exactly in real time. As you can see below, the auction had been posted about 35 minutes before I purchased it. It took me about two minutes between getting the text, logging in to the Remote Auction House on my iPhone, and buying the item. I’ve had notifications come in within only five minutes of being posted, and as long as the above example. In the situation last night, TUJ was also doing database maintenance at the time, so that could have caused a longer delay. Good luck and happy Auctioning! Very informative post! one day it will hopefully come to the EU, Didnt know it could even DM your twitter! amazing. Keep up the informative postings! Thank you for the comment and the add, Alto. I have a couple of posts lined up, and find that although I WANT to post them right away, I should probably hold off a bit. Otherwise I'll find myself with nothing to say for a few days! Heh!